You might join 2b2t and immediately think, "An impossible to survive server full of racist idiots" - and who could blame you? 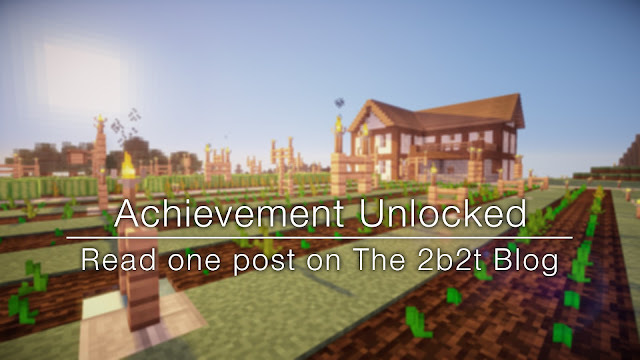 This post aims to reveal the true potential of your 2b2t experience and to hint at some interesting, long-lived player history and culture. From leading a group of 25+ players, to being the most notorious griefer in 2b2t history - peoples destinies on 2b2t have turned out varied and fascinating. There is a LOT more to 2b2t than the chat and spawn if you're willing to dig your nails in; including in-jokes as well as epic legends. If you stick around on 2b2t for long enough, are likeable, and put in work - be it constructive or destructive - you will have a surprisingly engaging experience on 2b2t. This post is a lighthearted list detailing the kinds of things you might experience on your 2b2t journey. "1 Little Newfriend" - get out of spawn. "Bad Company" - be betrayed by a basemate. "Welcome to 2b2t" - have your base griefed "rekt" - be killed by another player. "Oops" - accidentally leak your coords. "Give Peace A Chance" - make a new friend on 2b2t. "Assguard" - grief your own base after accidentally leaking your coords. "Third Time, Joke's on Me" - have 3 bases griefed in 1 year. "Fresh Meat" - be killed at spawn by Silver or Pony. "Fish & Wildlife" - be killed at spawn by Pompano or Fubster. "OreMonger" - destroy an offensive symbol. "Vice Grip" - be online during the Vice invasion. "Wrath" - visit Wrath (SIB). "Intensely Annoying" - ask where the trees are. ">has voted!" - use /kill for the first time. "Pharaoh" - visit the Valley of Wheat. "700" - visit 700Base. "Cerebral Trauma" - invite a player with a poor reputation to your base more than once. "The Gape" - visit Cyto's Gape. "Hangover" - Login and find yourself in a griefed base. "Squatters Rights" - Log in to see someone else has made your base their home. "Stone Made" - log onto 2b2t for the first time. "Nice Blog" - tell everyone in chat about the normal and uninteresting things you're doing. "The Mark of The Beast" - be killed by someone wielding 666. "The Lonely Road" - travel ten thousand blocks on the nether highways. "Big Player" - base with a legendary player. "Person of Interest" - have your base griefed by a legendary player. "Far Out" - have a base at least 1 million blocks away from spawn. "Base Hunter" - find an intact regular's base at least 50k out. "Lonely Hearts Club" - base at 2k2k. "Assassin" - kill any regular. "Teamwork" - participate in a group base of 5+ regulars. "Leader" - lead a group of 5+ regulars. "Split Persona" - have a secret alt for over 6 months. "Tempmap" - play during a tempmap. "u mad!?" - be online at the same time as chrisleighton. "Burnt Crumpets" - be griefed by x0xp. "The Long Haul" - stay at one base for over a year. "In Too Deep" - participate in a 2b2t Skype chat. "Regular" - play on the server weekly for 9 months. "Sun" - [secret achievement] you know who you are. "BTS" - Duplicate any item (except Rails) "Walking On Sunshine" - kill a tamed wolf at someone else's base. "Contraband" - own an item that's impossible to get in survival Minecraft - such as old wood slabs, portal blocks and player heads. "Archaeologist" - peacefully visit a regular's old griefed base outside of spawn. "Monument Men" - restore an old griefed base. "Friend of 2b2t" - create some 2b2t-based media. "Odyssey" - read Judge's 2b2t comic (18+). "The Collection" - view the 2b2t cards (18+). "Library" - view an original 2b2t Facepunch thread. "No, Seriously, Nice Blog" - Come up with a blog idea and email the blog owner. "Traitor" - be a traitor to your own group. "Free Speech" - grief OreMonger. "Hated" - grief 3 regulars' bases. "Tracker" - grief a base at least 1 million blocks away from spawn. "Lava + Water = ?" - make a lavacast. "A Noble Cause" - destroy a farm at spawn. "God's Work" - patrol spawn, killing newfriends. "Elder" - play on 2b2t during the first 1.5 years of its near-five-years existence. "Facepuncher" - be part of an original FP republic. "Valkyrian" - base with Sato86. "Artifact" - own a genuine, original legendary player's named item, such as Pyro's Byte. "VIDEO GAMES" - base with hinderjd/JUSTGMAN. "Vault" - [secret achievement] you know who you are. "Slayer Of Legends" - kill a legendary player. "Destiny" - become a legendary player. "Incursion" - participate in one of Sato's Spawn Incursions. "Usurper of the Crown" - kill chrisleighton or Pyrobyte. "Kino-Brand" - own a genuine, original Kino-brand item. "Justice" - kill a notorious greifer. "Emperor" - lead a group base of 10+ players including only regulars and legendary players. "Notorious" - grief a legendary base. "On The Shoulders Of Giants" - peacefully visit a legendary old griefed base outside of spawn. "Hause..." - be online when the server owner is online. "BibleBot" - have BibleBot recite a verse for you. "All Atheists" - witness chat being triggered by BuildSmash. "Spam" - witness spam in chat from a regular. "I Just Picked Up 17 Dirt!" - witness client spam by popbob. "Hey, check out my base" - click a link on 2b2t (18+, strongly not advised). "Pesky Ants" - have your text changed by the word changer feature (activated by donations). "Not So Bad After All" - have a relaxed, intelligent conversation in chat. "Donator" - donate to the server. "Xarviar" - stand still at your base and shitpost for 2 hours. "Coco" - laugh out loud at something coconut4 said. ">implying I don't know math" - witness Victor96 talking about maths or science. Old and new friends alike - feel free to comment below with your greatest (or smallest) achievements! Didn't know being at 1mil away could be considered regular. Glad to know I'm a Legendary. just made a base on the negative side of spawn. have my first person on their way to help me.